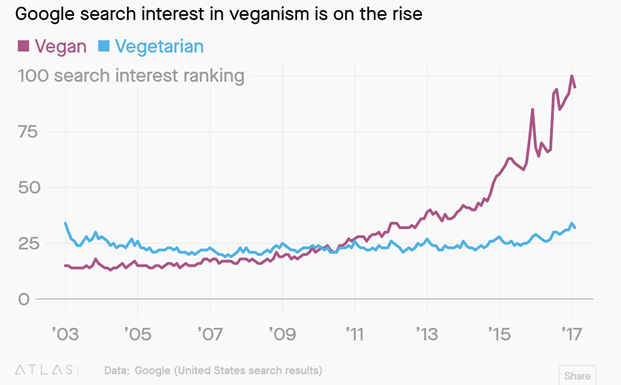 Every year we see trends come and go, but Veganism is finally having its moment, having eclipsed Vegetarianism in Google Search spikes. This trend is here to stay as brands rush to cash in on the burgeoning interest. From an advertising perspective, even for die-hard carnivores, it’s a great example of an exploding trend creating huge opportunities for advertisers. How should online advertisers take advantage of the burgeoning consumer interest? A key feature of this trend, like most trends, is that it’s being simultaneously driven by a variety of diverse influences – from Brands, News Stories, Pop Culture and Influencers. Brands are increasingly looking to tap into the consumer zeitgeist and target some of the 3.5 UK million vegans and countless others experimenting with flexitarianism. To do this, they need to fully leverage the stimuli behind the intent. We’ve seen a surge in mainstream brands announcing Vegan product lines, from Tesco’s Vegan Range to Pizza Hut’s Vegan Menu, causing ‘Pizza Hut Vegan Cheese’ to trend on Search. As these news stories break, they create ripples and waves of intent in Search and Social channels. 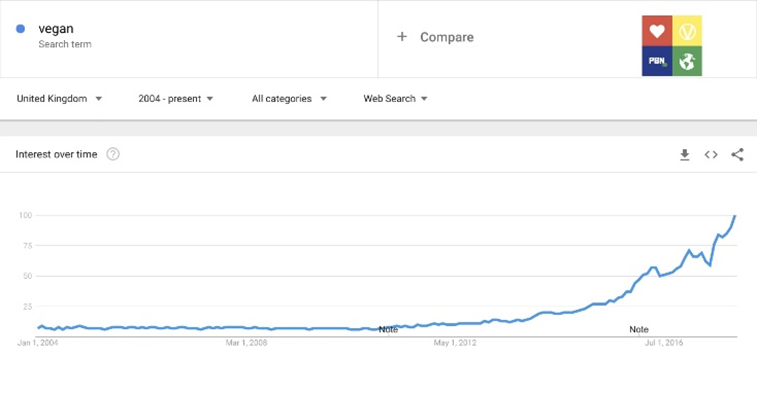 These waves of interest can find renewed momentum; the question: ‘is Guinness Vegan’ continues to trend – with a 4,000% boost in Google searches over the last year alone despite Guinness announcing this way back in April 2017. But the real firepower driving and even accelerating this Search trend is not brands themselves but Influencers. From boxer David Haye, singer Paul McCartney, chef Gordon Ramsay and racing driver Lewis Hamilton, high profile endorsement is everywhere. All this is happening against the powerful phenomenon of vegan-friendly documentaries spanning anything from nutrition to animal welfare and environmental sustainability. Just one film Okja generated a 65% increase in Google searches ‘vegan’ in the six weeks after release. It’s really no surprise that The Great British Bake Off has announced its first vegan week, to “represent what was happening in this country,” explained judge Paul Hollywood. And to top it all off, we now have a seasonal Search trigger: Vegan January aka Veganuary. Annual Search interest is accelerating. But this is good. More diversity means more opportunities for advertisers. So where should brands begin? How can they connect with interested audiences and capture new audience intent? And ultimately, how can they make budgets go further? Imagine being able to sync your advertising channels to Search spikes. Imagine serving your ad at exactly the moment consumers are searching, to connect with them when it matters most. Being nimble and reactive can be a secret weapon. This is where data science and insight come to the rescue. For example here at Mporium we use data to determine the most relevant consumer stimuli to sync with our client’s brand strategy. Then we empower our clients to automate advertising decisions: which creative to serve in the moment and which advertising action to take. Because it’s automated our clients can launch campaigns at scale in whichever channel they like: Search, Social and Display. It’s a great example of an ascendant trend becoming mainstream and creating huge upside for advertisers ready to react in real time.